In around 970, the Eastern Franconian nobleman Reinger founded the Parish of Detwang in the Tauber Valley, just below the eventual site of the town of Rothenburg. The Parish Church of St. Peter and Paul was the parent church of the later town church of St. James. Around 1080, the Counts of Komburg built a fortress on the so-called “Vinegar Jug” (next to the Infirmary). In 1116 the family endowed its largesse on the Convent of Komburg (near Schwäbisch Hall) and the Monastery of Neumünster in Würzburg. To begin with, the imperial town was controlled by royal officials. Gradually, a patrician upper class established itself as a civil administration in the form of a Council supported by numerous royal privileges. This development reached its peak in the Great Privilege of Freedom granted by King Rudolph in 1274. By the end of the 14th century, Rothenburg was in fact an almost autonomous town that only recognized the Emperor and Empire as higher authorities, in other words it had become an Imperial Town. At the beginning of the Modern Era, several events occurred that decisively changed the public life and the legal, social and religious structure of the town in the subsequent period. The members of the town’s once thriving and influential Jewish community had all been driven out by 1521. Social unrest and entanglement in the Peasant’s Revolt weakened the town in 1525. 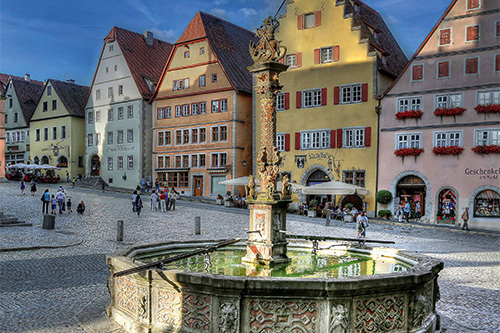 In 1544, Rothenburg broke its old church ties by embracing the Lutheran Protestant Reformation. The two convents were dissolved. The town lost much of its political significance but, thanks to its rich agricultural hinterland, remained an important economic factor in the region. This was changed by the Thirty Years’ War. 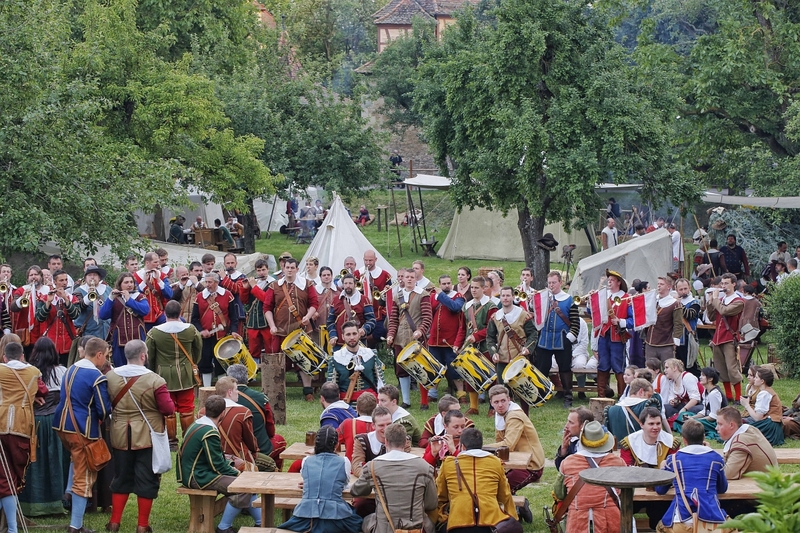 As a Protestant town, Rothenburg not only suffered from a permanent conflict of loyalties with the Catholic Lord of the town, the Habsburg Emperor, but was also condemned to economic ruin by passing armies, billeted soldiery, contributions obtained through coercion, and pillage. It was captured several times by the military (1631, 1645), and it population was decimated by plague. Rothenburg still retained its Imperial credentials for a further one hundred and fifty years. This finally came to an end in 1802 and 1803, when the town fell to the Kingdom of Bavaria as part of Napoleon’s reallocation of lands. In addition, the western part of its former territories was ceded to Württemberg in 1810. Rothenburg only started to recover when, in 1873, it was connected to the German railway network. Prior to this, the city had been “rediscovered” by artists, writers and academics and was presented to a broader national and international public as the epitome of “old German” urban architecture. Tourism began to play a key role in the town’s economic life. Industrialization also made its mark, albeit at a modest level, the population increased and the town prospered. From 1871 onwards, a small Jewish community settled in Rothenburg once again. The expulsion of this group in 1938 was a black day in the history of the town, which was glorified by the Third Reich as a perfect example of German culture from 1933 onwards. Another black day came in the shape of an American air raid during the last weeks of World War II, when around 45 per cent of the old walled town was destroyed. 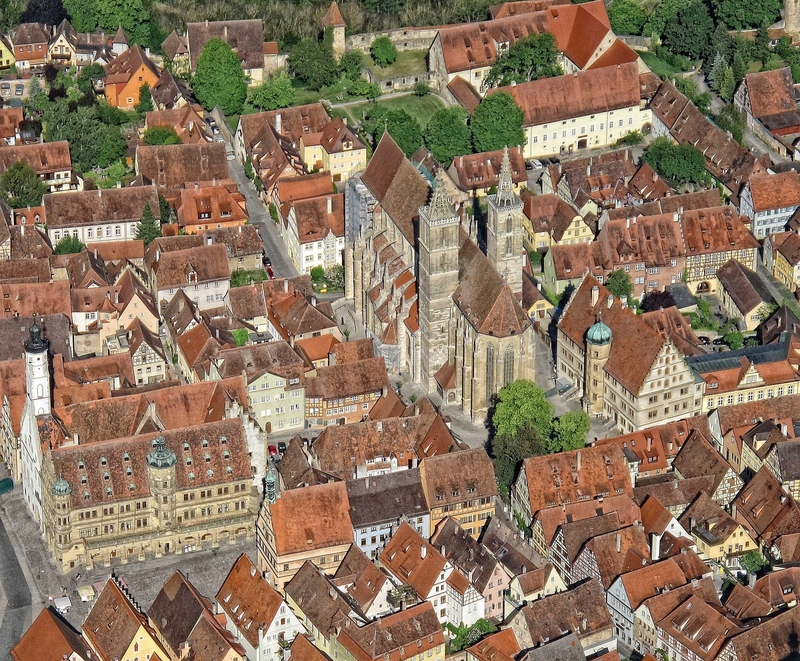 The successful rebuilding of the town in the post-war period is the most significant achievement in Rothenburg’s recent history.